But, as happens when I don’t approach Lady Watercolor in a joyful, bouncy mood…..she quickly stomped on my dancing toes. But wait, I can rinse it under the sink! Yes, except those quinacridones I love so much are stainers. They don’t rinse. And a watercolor fail was soon born. Enter Golden acrylics in Zinc White. Zinc White is a NON-opaque acrylic white. 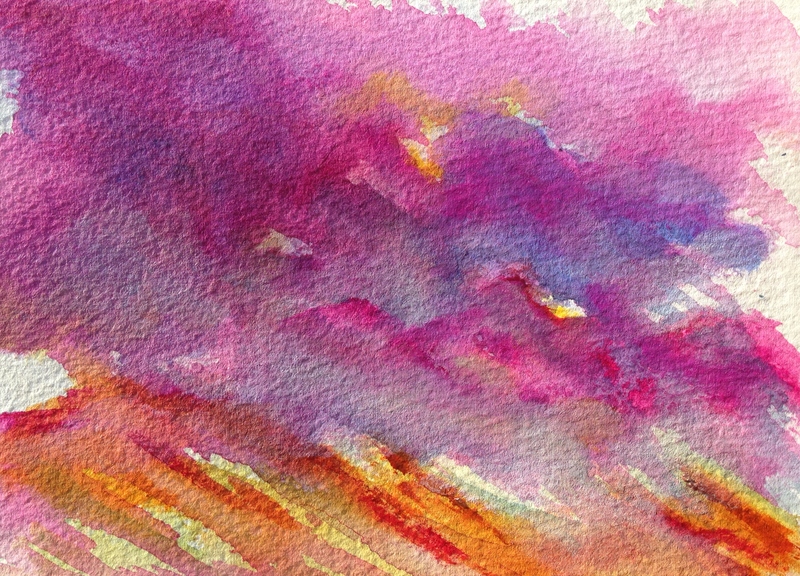 If you mix it with a touch of the color you’re trying to cover up/correct/blend, you can scrub it in over your dry watercolor painting, and it fades into the mist, as though you never made a correction at all. And no white flags waving! I should have taken a before and after photo. I realize this painting may not inspire anyone to try this method. But you should have seen it before. Having given up on the watercolor, and not wanting to throw the paper away, I thought it would be fun to try painting in acrylic on watercolor paper. (I loved it, by the way.) So I went in with several hard swipes of magenta and quin violet acrylic, thinking I’d try one of my abstract grid paintings. I was able to cover all of those lines, and swirl them right into the watercolor clouds I painted. Without big honking white splotches in the middle of my sky. Getting ready for July’s World Watercolor Month, as initiated by our friend Charlie at Doodlewash! I hope this sets someone free out there. Enjoy your weekend, especially all the dads! Peace. Glad you enjoy that paper too, Rebecca. Have you ever tried it with acrylics? I found it a lovely surface. This wound up being a wc painting with acrylic on top (first loose and very watered down and then more of the zinc white blending in). Don’t you love these accidental discoveries? I had just bought the zinc white to lighten and brighten without the “in-your-face-ness” of Titanium White. And along comes a wc fail (haha, they’re always quite plentiful when the wc palette makes an appearance)…..and I thought I’ll try that white and see what happens. And now I’ve got another tool in my toolbox. Not saying it would work for every single situation, but boy…..nice to know this works as a smooth blender. What a wonderful discovery, one that I’m sure I’ll be able to use in the future! Thanks for sharing it with us, Laura! You’re so welcome, Teresa! Gotta love those happy accidents! Looks like the fire in the Monzano mountains we have right now. What did you not like about squash? I like to say squash for gouache? Dawn, I didn’t like anything about it. It felt clunky, chalky, it was way too in your face. Granted, I have almost no experience with it, but it didn’t make me want to try it again anytime soon. Chalky does not appeal to me. Someone explained to me as being a cross between oils and water color…is that what you felt about it? Dawn, it’s hard for me to say, as I’ve never painted in oils (unless you count paint by number sets when I was little lol). I guess I could see what they’re saying, comparing the two. Hmm. I think Rebecca Evans might have painted in all three, and could tell you? I’d be curious what she’d say. I will have to ask her. I don’t know why I am so curious about it. Must be the name. Have you been wanting to try watercolor? Thinking about finding a middle ground? I wouldn’t mind exploring it as its own medium (if I had the time, money and space for yet another medium right now) but together with WC, I just don’t like it. I’ve seen people use gesso over WC and I think that looks much better. Maybe it’s just me? I tried water color a few months before I started oil paintings many years ago and after I got oil paint, I never went back. Watercolor wasn’t bright enough for me. I was just using computer paper and Walgreens cheap kids watercolor and the brush that came with it, but my poppy used the whole cake of red to get it as bright as I wanted. The poppy hangs at my mom’s house. I did a sunflower and some abstracts also. What I like about water color is the easy cleanup. Can’t beat it! I bought some water color pencils last fall and I can’t stand them. I have never used good paper and good paints though so that might make a difference. True and it does. What about Inktense WC pencils. Ever tried those? They’re really vibrant. No ma’am. I stay in my little box these days. I have some acrylics that I pretty much never use also. We save those for sister party paint days when we paint with Cinnamon the Art Sherpa. She wears funny hats and has an apron for every occasion and her classes are easy so we enjoy our girl day hangouts with her. Art for every occasion, lol! The inktense are made with ink and once dry, they’re permanent. Much more intense than typical WC pencils. I started with WC pencils, a set of the traditional ones. I haven’t used them in awhile, may drag them out for WC month next month. WC frustrates the bejesus out of me, honestly. The more I paint with acrylics, the less I wanna even mess with them but at times I still love them. Only wet on wet! Inktense….okay. It is in my brain. Thank you for the suggestion. If I ever try again, I will be sure to get those. Of course your comments about acrylic at the end there put me back to…nah, don’t need to do watercolor. Hehe. Lol! Well if you ever feel like something pointy and vibrant, it does exist! Good to know. They’re permanent too so that’s a big plus. Won’t move and turn to mush like WC pigment. Very good to know and you never know, I might want pointy and vibrant one day. Right? Yes. I need to get those babies out and let ’em roll! Pointy+vibrant = fun. I was thinking about you the other day re the fire. I hope they’re nowhere near you. I am on the desert side of the city vs the mountain side. My house faces the mountains though so I can see it, but it is not near me. That’s a relief. Glad to hear it. Smokey though. Hate that. We are no strangers to fire here. Rain! We need rain. Yeah. Sending prayers up for you guys. I wouldn’t like the smoke either, but it sure beats fire. Very glad there isn’t fire at my house. Agreed. Nina has always loved Arches paper. I like the painting and you should consider maybe collaging or cutting it up and repurposing it if you’re unsatisfied. I do think gouache is different in feel than watercolor or acrylic. I don’t find it chalky at all though. You can use it a lot of different ways. It used to be a mainstay of painted print design (before the digital age) and that’s where I first used it. But that was very exact and controlled. When I paint with it now, I mostly use it right out of the tube and kind of mix layers when painting…all of my recent bird paintings have used it. Thanks for the info, Kerfe. I don’t know nearly enough about it, but I appreciate your insights. I’m gonna try painting on the back of this and then I do keep a pile of WC fails for collage. Mainly because I am always inspired when I see what you, Jill, and others do with collage! Yes, Jill has some amazing ideas for recycling! She has no fear. An interesting experiment with that paper. Love your use of color. My fav Arches WC paper 140#”CP…..someday I must try the 300#. Teri, thank you. It’s much more scrubbable and even with the acrylic paint, it barely warped. This is only 5×7″ but still. I like the texture too, even for acrylic. Oh now….wc won’t stomp, it is “dancing!” lol I love your serendipitous adventure and I love your painting, I think that with so many artist paints, equipment, it is easy to fall into a discovery like what you have experienced. I think this is what art is all about and you showed that very well Laura! That grain in the paper is great ~ your pure color pops, and the white is what I do with gesso. Excellent fail to fabulous! Thanks, C! I appreciate that. Zinc white is not opaque, and doesn’t wave the white flag quite as much as gesso or titanium white. I think they each have their place but now that I have zinc white I’ll be using it a lot more than titanium white. They all have their place, just nice to know there are other options. I’ve tried it, I think, I have to check my stash! Yes I have Chinese White (Zinc) watercolor … : ) Thanks for the reminder to use it and how! Sure! I assume zinc white watercolor works the same as acrylic(?) and that properties are the same from one brand to another but you’ll find that out, I’m sure. Oh, probably not – well, I’m learning lots. Will have to explore more what you’re doing! Titanium White is the more common of the whites used for painting. It’s known for being bright white, almost bluish, and has excellent opacity and high tinting strength. When mixed with another color, it rapidly lightens the color. The drawback of Titanium White is it can be over-bearing at times, especially when you are just looking to lighten the value a bit and not greatly change the color it’s mixed with. Enter Zinc White. Zinc White is very transparent, and has 1/10th the tinting strength of Titanium White. The pigment itself is highly translucent, and compliments other transparent pigments, such as Quinacridones, Phthalos, and Hansas very well. You have more control when you add Zinc White. When you add it to another color to lighten it, it doesn’t immediately change it to a pastel shade, like Titanium White can. Both are great colors to have on hand, and you should test both with a variety of other colors to see their strengths and weaknesses first hand.” Now I get it – especially after I read your post. Thanks!!! Awesome! And thanks for sharing that with me too. They said it much better than I did. I didn’t know it was 1/10 as strong either. So much to learn! This one is a good one. Have fun with it! This is lovely! The fix blends beautifully and thanks for sharing your process… and woes! hehe… I always have a tube of white gouache at the ready, just in case, as I’m prone to totally kill my whites in my speed painting. But the acrylic sounds much cooler… like White Out! I might need to try that! hehe! Those are the best! Thanks! I appreciate you stopping by! I’m glad I’m not the only one, I have a feeling zinc white will be my go to white now. beautiful bold colors, with a wonderful free adventuring spirit….. now that’s what I’m talking about!! you do! it is like your personal trademark. Sounds wonderful, Donna! I was wondering where you’re journeying to these days! Lucky ducky! It’s beautiful! Utah and Colorado are breathtaking IMO. Have fun!!! Thanks, Leslie! I feel like a mad scientist, but I’m having fun and making discoveries I can use. Can’t keep that info to myself! Really glad you stopped by. Much appreciated. Hey Dawn, so glad you found it useful! Thanks for the follow, by the way! I have the same trouble remembering, which is part of the reason why I blog lol. Have a great week!